Comment: New with a small dent to the front cover. 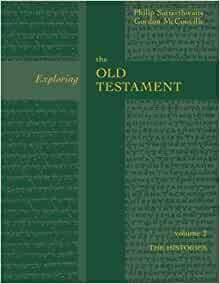 Start reading Exploring the Old Testament Vol 2: The History (Vol. 2) on your Kindle in under a minute. Designed to help students actively engage with the Old Testament, this title contains questions to encourage further thought. Again, not as good as the NT equivalent. Every one of these books, are good value. Also the date, and day of delivery was exact to the day. I found them good for the type of studying I'm doing at the moment. Not too intense, but full of facts. Exploring the Old Testament: The Histories, vol. 2, by Philip Satterthwaite and Gordon McConville, continues the same excellent standard of evangelical scholarship found in volume 1 of this series on The Pentateuch. Having already given an overview of the purpose of this series (read my review on vol. 1), I will focus on the contents of The Histories. The Histories gives an overview of Joshua, Judges, Samuel, Kings, Ruth, Esther, Ezra, Nehemiah, and Chronicles. If you’re wondering about the order, the authors follow the Hebrew ordering of the biblical books, rather than the English ordering (which is based on the Septuagint = LXX). One of the purposes for this is so that the books that scholars frequently designate as “the Deuteronomistic History” (Joshua – Kings) can be treated consecutively. Following the Hebrew ordering of the books also allows the authors to make contrasting observations about the effect of each canonical ordering (Hebrew vs. English = the LXX) on the reader. For example, the order in English Bibles of the histories ends on somewhat of a downer with Nehemiah struggling to contain the Jewish community’s waywardness (Neh. 13 ) and Esther and Mordecai narrowly helping the Jews escape annihilation at the hands of the Persian Empire (Esther). McConville concludes that, “This unpromising end to the ‘history’ of Israel leaves an open question in English Bibles to which the prophetic section of the Old Testament gives an answer, with its predominant structure of judgment followed by salvation” (p. 288). Conversely, the order in the Hebrew Bible includes Ezra, Nehemiah and Chronicles in the last portion of the Canon known as “The Writings.” Notice that these books are also placed out of chronological order so that Chronicles comes after Ezra and Nehemiah. In fact, Chronicles is the last book of the Hebrew Bible. According to McConville, “This suggests that the Hebrew canonizers wished to allow Chronicles’ report of deliverance from exile (2 Chron. 36:22-23 ) to be the final word in the story of the post-exilic community” (p. 288). Philip Satterthwaite begins this volume with a brief “Introduction” followed by chapter 1 which is entitled: “What are the Histories? A survey of recent scholarship,” which deals with such topics as “The Histories as literary texts,” “The Histories as Historical documents,” “The Histories as part of a larger story,” and the theology and ethics of the Histories. In this chapter, and throughout the volume as a whole, the authors are very fair in presenting various scholarly approaches and methods, while citing their own presuppositions and approaches. For example, Satterthwaite notes that he and McConville see the Histories as “artfully constructed texts,” and while understanding that various sources and hands may have played a part in the formation of the Histories, he states that, “Our interpretations of the Histories begin with an assumption of literary unity” (p. 25). After a brief overview of ancient Near Eastern history in chapter 2, a survey of the biblical books, beginning with Joshua, starts in chapter 3. The chapters adhere to the following outline: 1) An outline of the book which includes a chapter-by-chapter breakdown of the contents; 2) key themes of the book; 3) critical issues–dealing with various issues that have arisen in the scholarly study of the book; 4) historical issues; and 5) how the book is reflected throughout the rest of the biblical canon. Each chapter, like its predecessor (The Pentateuch, vol. 1), is also interspersed with boxes dealing with special issues or question boxes prompting students to “dig deeper.” Satterthwaite is responsible for the material in chapters 3-7, while McConville is the author of chapters 8-11. Because the review would be too long to include comments about each chapter, I have chosen a few chapters to illustrate the content. Chapter 5: 1 and 2 Samuel–Satterthwaite follows the usual outline of the books of Samuel, except that he includes 2 Samuel 8 with chapters 9-20. Notable observations include connections between 1 Samuel 1-15 with the Book of Judges (pp. 105-106); the contrast between faithful and unfaithful leaders in 1 and 2 Samuel (p. 108); rather than “anti-monarchic” and “pro-monarchic” sources in 1 Samuel 8-12, both authors argue for a “unified but nuanced account of Saul’s rise…. The people were wrong to ask for a king, not because monarchy was intrinsically unsuitable for Israel, but because they asked with wrong motives; the result was that a wrong sort of king was chosen” (p. 112). Among some of the difficulties addressed, Satterthwaite discusses the evil spirit from the Lord sent upon Saul (p. 116); and two ways of looking at the execution of Saul’s sons by the Gibeonites (2 Sam. 21:1-14 , p. 133). Other tough issues such as the question of double narratives in 1 Samuel 16-17 (p. 117), Saul’s séance (119), and whether Mephibosheth or Ziba was lying (p. 130), are left for students to chew over. Under “Key Themes” Satterthwaite lists the “Rise of monarchy: theological implications,” “Prophecy,” “Monarchy: politics, pragmatism and image?,” and “Divine-human interaction.” Under “Literary Critical Issues,” Satterthwaite discusses some of the usual sources proposed by scholars such as “The History of David’s Rise” (1 Sam. 16:14 -2 Sam. 5:25 ) and the “Succession Narrative” (2 Sam. 9-20 and 1 Kings 1-2), but concludes that, while there are undoubtedly different sources and traditions underlying the material, it is not easy to identify such sources in the present text of Samuel. Therefore he concludes, “In their present form, 1 and 2 Samuel are more or less a seamless robe” (p. 139). Satterthwaite accepts the picture laid out in the books of Samuel as historical. He also notes the famous Tel Dan Stela which provides archaeological evidence for the existence of the Davidic monarchy (p. 142). Before leaving a discussion of those books designated as “The Deuteronomistic History” (DH), I should note that Satterthwaite devotes an entire chapter (chapter 7) to the origins and history of this well entrenched scholarly dogma. He discusses the origins of the original proposal by Martin Noth in 1943, and presents an overview of Noth’s basic thesis. Satterthwaite follows this up by looking at the various ways in which Noth’s original proposal has been revised or altered. Satterthwaite proves himself capable of some literary humor when, after finishing this survey, he quips to the reader, “Are you still awake?” (p. 208). Actually, I found Satterthwaite’s (McConville should be included here as well. The author frequently refers to “we”) evaluation of the DH and its scholarly mutations interesting. The authors agree that there are significant links between the ending and beginning of the various books “which are often reinforced by verbal echoes (e.g., compare Josh. 1 and Deut. 31 and 34 … )” (p. 208). They also agree that “the perspective of Joshua-Kings is ultimately that of the sixth century BC, simply on the basis that 2 Kings ends its account in that century” (p. 209). However, Satterthwaite and McConville also have important objections to the DH theory. They believe that Joshua-Samuel “(or something close to them) might have come into existence much earlier than is often argued” (p. 210). The authors point out that “According to a standard view Deuteronomy in its present form is a largely seventh-century work, linked to Josiah’s reforms” (p. 211), but they argue, “This, of course, runs contrary to the testimony of Joshua-Kings, according to which something like Deuteronomy (‘the Book of the Law’) was current long before the seventh century” (p. 211). Furthermore Satterthwaite states, “… the theological framework of Deuteronomy (linking faithfulness with blessing, unfaithfulness with judgment), which is what scholars often have in view when they argue that a text in Joshua-Kings reflects Deuteronomic influence, is not properly Deuteronomic at all, but a theological commonplace of the ancient Near East” (p. 211). Along these lines, the authors also note that the theology of Joshua-Kings is more complex than the simple “faithfulness brings blessing, unfaithfulness judgment.” Satterthwaite states these books “do not always conform to that schema; on the contrary, there are many unforeseen twists in Israel’s history, and they almost all relate to unexpected displays of divine grace” (p. 214). Another valid objection presented is that Joshua-Kings not only shows evidence of the Book of Deuteronomy, but also “significant echoes of Genesis-Numbers (particularly Genesis and Exodus)” (p. 216). In conclusion both authors question “the viability of the whole DH enterprise” (p. 217). While admitting that their position is not necessarily stronger, they claim that it is no weaker. I find myself in agreement with much that the authors say in this chapter. Chapter 9: Esther–McConville’s outline of Esther follows the chapter divisions. He notes that a serious consideration of the Book of Esther prompts some provocative questions. For example, while most post-exilic books focus on the return to Judah, “In Esther, Jewish life goes on at the heart of the empire itself, with no apparent sense that Jews ought to return there” (p. 231). Furthermore, what is the reader to make of Esther’s marriage to a foreign king and the fact that she eats the food given to her without making objections based on Jewish food laws? The books of Daniel and Ezra-Nehemiah demonstrate other viewpoints on these important issues. McConville is keen to note the literary artistry of the Book of Esther, including its use of irony and perhaps comedy. He includes a “Think about” box which discusses the idea of the potential use of comedy in Esther (p. 241). McConville sees the “Key Themes” being, “God and events” (“The coincidences can be seen as evidence, not of randomness, but of God’s providential ordering of things”, p. 236); “Providence, prayer, and responsibility,” and “Retribution” (which prompts an important discussion about how such a theme should be viewed, p. 237). “Critical Issues” looks at the additions to Esther found in the Greek text. McConville points out where the additions occur and how these additions differ theologically from the other form of the book. One important feature of the additions is the explicit mention of God. As most are aware, the edition of Esther found in our English bibles never uses the word “God” or any form of God’s name. Satterthwaite and McConville have written an excellent introduction to the Histories, geared toward the undergraduate student and interested lay person. Those who identify with these “learning labels” will surely find discussions of “Critical Issues,” and the chapter on “The Deuteronomistic History” deep wading, and perhaps as Satterthwaite jests, a bit difficult to keep one’s eyes open. Some might even object that such material could be dispensed with. I would disagree, however. Anyone seeking a deeper understanding of the Histories will inevitably seek out commentaries, dictionary articles, etc. to enhance their comprehension. In doing so, they will encounter all of the views (and many more) spelled out in this volume. Exploring the Old Testament: The Histories, gives the student a starting point of understanding concerning what the issues, presuppositions, and conclusions are of the scholarly literature that they will inevitably turn to. But more importantly, this volume is full of valuable information and insights. The content overviews of each biblical book is worth the price alone. The special boxes and charts enhance the learning process. Personally, I found myself in agreement with much of what Satterthwaite and McConville write, but I also found them fair in representing other approaches and scholarly positions. If you are interested in learning more about “The Histories,” then I would highly recommend this book as a well-written and informative introduction to them. Randy McCracken is the author of "Family Portraits: Character Studies in 1 and 2 Samuel."